I participated in a campaign on behalf of Mom Central Consulting for Kohl’s. I received a promotional item as a thank you for participating. I tried my best folks. I figured if I could just bury my head in a tent all summer, magically the stress of back-to-school prep would just disappear. Since coming back home though, reality has set in, and I now realize that there are only about three short weeks until the boys go back to school. What is that? Where did our summer go? The number one thing I love about Kohl's is that they have a huge boy's section. Unlike most other stores in town, that have a rack or two for boys and half a store for girls, the boy's section at our local Kohl's is backed full of all the brands my boys love, like Nike, Tony Hawk and Chaps. Not to mention, the prices are always right. There is always a sale going on, and you can combine coupons, Kohl's Cash and Kohl's Charge Card discounts to save as much as humanly possible. Sign up online, and you can even receive even more discounts and coupons through the mail! Don't worry, Kohl's isn't just about the boys either. If possible, their offering of clothes for girls is even more expansive. If it is pink, frilly and girly, Kohl's is going to have it, and the same great deals and discounts apply. 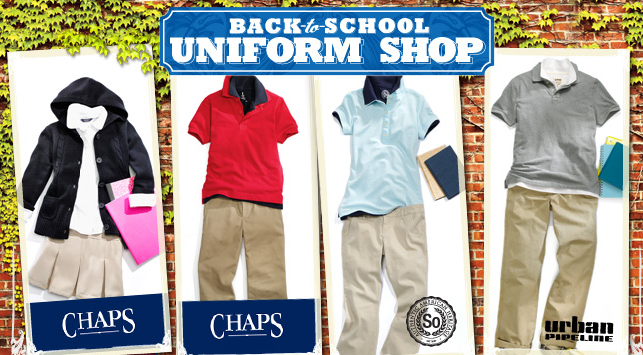 Is your child stuck wearing a uniform? No need to go elsewhere, Kohl's has a uniform shop as well. Another great Kohl's feature is the ability to make a shopping list before you leave home on their site. Plug in your budget and you are good to go when you walk in the store. This is infinitely helpful if you are absentminded like myself. Check back in the coming weeks as I go shopping for my boy's back-to-school clothes at Kohl's and share our purchase and savings with all of you! 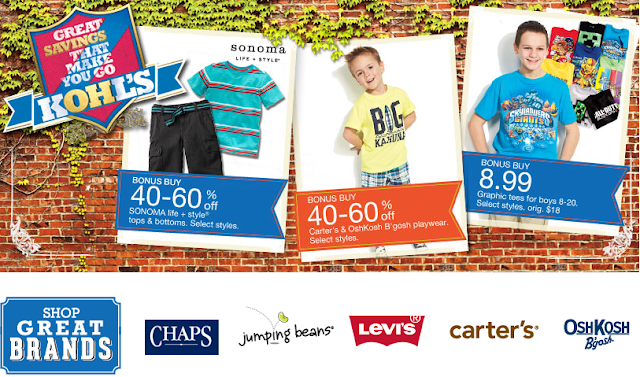 Kohl's is one of my go-to's for back-to-school shopping. Great choices at great prices! I love Kohl's but haven't shopped there in a good while. This weekend during the tax free weekend, I will attempt to go! Im so glad that my kids do NOT have uniforms (as we thought that they did) so we didn't have to do much back to school shopping. Though when winter shopping comes, I surely will check Kohl since I have heard so much about their great sales! 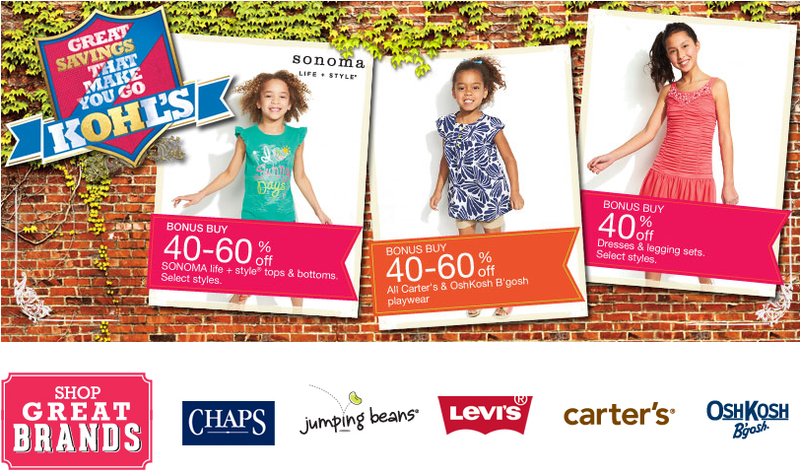 We are headed to Kohl's next week to start on our back to school shopping. This is our first year going to the BIG school. We'll have to go to Kohl's so he doesn't look like he just fell off a turnip truck. I love Kohl's! I was there today, actually...doing some serious damage, and that was WITH all of the savings...lol! Kohl's is our go to place for clothes for all of us. In fact I need to go soon to buy some fall clothes for my toddler. I love Kohl's and am excited because I have a 20% off coupon and this weekend is the back-to-school tax-free shopping weekend. Sweet! We always head to Kohl's for back to school shopping. Love collecting Kohl's cash! I love Kohl's - I primarily buy homegoods there, but this summer picked up a purse, some undergarments and some flip flops for a steal! I love back to school at Kohl's. They have such great deals. I have a Kohl's obsession! I recently purchased 5 pair of uniform shorts, 4 pair of uniform pants and 2 uniform shirts for under $50 thanks to coupons and a good 30% feature. I love Kohl's -- their sales and Kohl's cash are awesome!